1960 Ford Rear Bumper ---- SCAM ALERT! No scam by PM. I was asked to text to a phone number that was provided in the PM. When I texted my requests to that phone number a "?" was my only reply. The actual scammer contacted me through email. Wanted: 1960 full-size Ford rear bumper. NOS or excellent used with no dents or tow damage. Thanks. Rick I've had three responses to this ad. All three made me feel uncomfortable with the most recent being an obvious scam. I've deleted my contact information and will not respond to any PMs. Be aware of emails from an individual named Carl Maverick. I believe you are talking about the fiber optic cable. The cable connected to a bulb with a special socket inside the door. It illuminated the thermometer when the park or headlamps were on. There was no temperature sensor for the mirror. My experience was with Oldsmobile. Buick was probably the same. Looks like a 1950. The grille wraps around the fender towards the wheel well on a 1950. You can see the grille extending towards the wheel well on your grandfather's car. I don't think a 1949 grille would be visible when photographed from the rear 3/4 view in your photo. 1941 Cadillac 4 -DR 61 Series Fastback. This is the house at the address on the ID card. I expected something a bit more upscale. Check the canister purge valve. Look on your under hood vacuum diagram to locate it. They can cause a lot of drivability problems and intermittent check engine lights. When vacuum is applied to the top port (the one that is supplied vacuum from the carb) it should hold vacuum. There should be no fuel visible at this port. If either of these conditions exists the diaphragm is ruptured and the valve needs to be replaced. Good luck. I believe Fleek is correct. 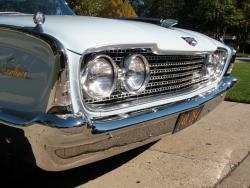 The parts book shows the same rear door part number for Galaxie Town Sedan, Fairlane Town Sedan, Galaxie Town Victoria and all four door wagons. I think the actual door assembly will fit all of those bodies. There is no frame for the glass on a Town Victoria. You may have to break the welds and exchange the glass frame from one style to another. I could not find part numbers for the glass frames. It doesn't mean there are no part numbers. It just means I couldn't find them. I hope this helps. http://www.lebaronbonney.com They were an exact match for the two cars I reupholstered. A 60 and 61 Sunliner. Very good to work with. They were able to match the material that I needed.